If you’re a model train beginner, you might not even be aware that there are a variety of different model train scales and gauges to consider. But once you become aware of this fact, you’ll naturally begin to wonder which is the ideal selection for your needs. 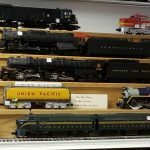 We only sell O scale trains in Ewing, NJ at our model train store. However, it is still important to have an understanding of the different types of scales. First, it’s important to understand what scale refers to. Scale refers to the number of times the train has been scaled down from its actual size. An HO scale train, for example, is 1/87 the size of an actual train. The gauge, meanwhile, is a separate term from its scale, and refers to the width between the inside running edges of the track. O scale trains are, therefore, the largest scale of model trains. All the trees, bridges, buildings, roads and other accessories you purchase for your trains should be built to the same scale of the train you have—otherwise it’ll just look off. The amount of space you have: How much space do you have, and how much are you willing to dedicate to your trains? O scale is obviously a much larger commitment—HO scale is half the size, and is one of the most popular scales due to its relatively easy entry point. Smaller scales, therefore, can be ideal for beginners, but larger scales allow you to create much more detail and realism in your layouts. The scale you prefer working with: Do you have a preference about the size of scale you wish to work with? Some people who have sight difficulties, for example, prefer the bigger trains and accessories because it’s easier to create layouts with them. Children might find it easier to operate the bigger scales as well, and those bigger sizes tend to be less likely to derail. However, the smaller and more intricate scales might be ideal for people with big ideas but not a whole lot of actual physical space. The accessories that are available: HO scale is the most popular scale, and therefore has the most accessories. However, that doesn’t mean accessories are hard to find in other sizes. It can help to perform a check to see what is actually available beyond just the trains and tracks when beginning your collection. You’ll likely be surprised by just how much variety there is at each scale level! These are just a few of the considerations you should keep in mind when starting up a new model train collection. Have questions? Our team at Trains & Things is happy to provide you with more information about O scale trains in Ewing, NJ.